For lactose intolerants and maldigesters, avoidance of milk and dairy products could have health consequences. 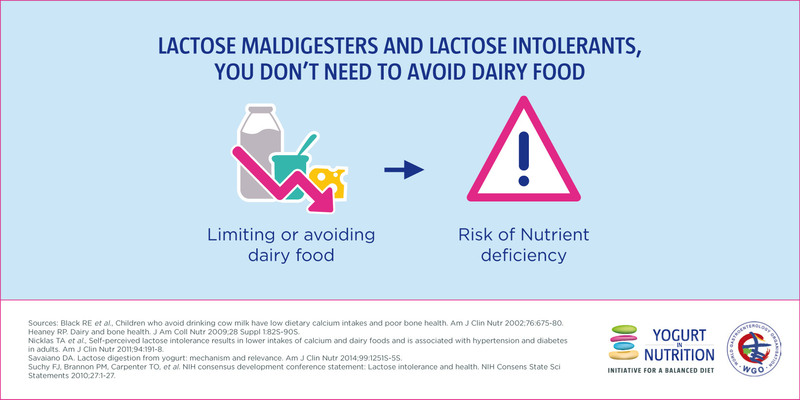 Many medical organizations recommend that lactose maldigesters and intolerants should not avoid dairy foods in order to prevent nutrients shortcomings. Lactose maldigesters and intolerants should adapt their diet. Small amounts of lactose can still be consumed without triggering any symptoms. The consumption of yogurt, which contains live bacteria that help digesting the lactose it contains, and of cheeses that contain low or no lactose is possible and even encouraged (cheddar, provolone, mozzarella, etc.). Lactose-free food or avoidance of dairy food is only needed for the rare infants with congenital lactase deficiency. Total lactase deficiency is rare (less than 50 patients in the world, mainly in Finland). It is a genetic disorder called congenital lactase deficiency. Lactase supplemented food are also not necessary for lactose maldigesters and lactose intolerants. Heaney et la. J Am Coll Nutr 2009;28 Suppl 1:82S-90S. Lukito et al. Asia Pac J Clin Nutr 2015;24 Suppl 1:S1-8. Vandenplas et al. Asia Pac J Clin Nutr 2015;24 Suppl 1:S9-13. What is the difference between lactose maldigestion and lactose intolerance? Can lactose intolerance get better? Why can I eat yogurt while I am lactose intolerant?